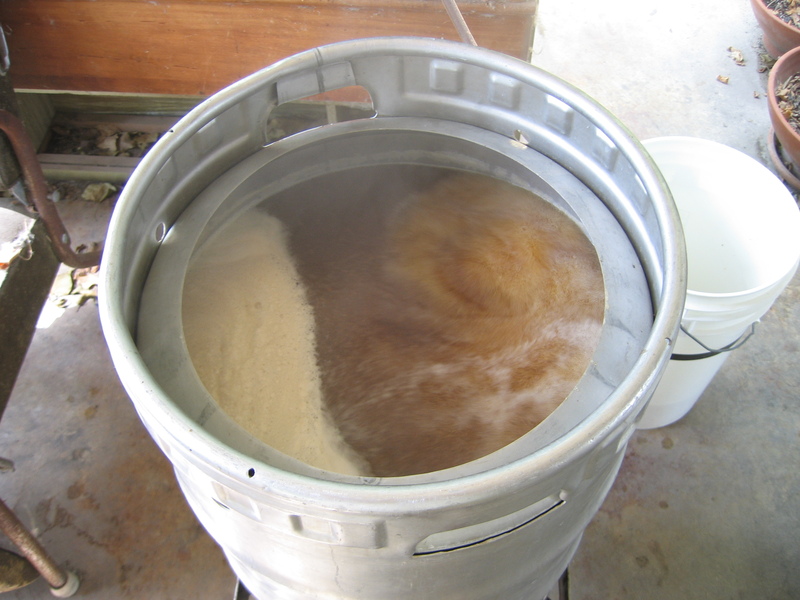 Wort production — mashing and running off the wort — for a Maibock is unlikely to cause most homebrewers any problems. For a 5.0-gallon (19-L) batch, you’ll need 11–16 lbs. (5.0–7.3 kg) of grain — assuming you get an extract efficiency between 65 and 80% — to hit your target original gravity (OG 1.064–1.072). If you have a 10-gallon (38-L) or larger mash tun, you’ll have plenty of room. For some homebrewers, however, kettle size may be limiting. Fully-sparged, 11–16 lb. of grain should yield 7 to 10 gallons (26 to 38 L) of pre-boil wort at around 11 °Plato (SG 1.044). If your extract efficiency is on the low end, and you’re shooting for a Maibock on the high end of the OG range, a 10-gallon (38-L) kettle will not be large enough. To calculate how much pre-boil wort your grain bed will yield, assuming it is fully sparged, multiply your weight of your grain bed (in pounds) times 0.65 gallons per pound — this will give you a rough approximation (in gallons) of the volume of pre-boil wort. If this is more than you can comfortably boil in 90 minutes, you can add more grain to your recipe, but collect less wort. (Estimating how much grain to add can be tricky, though.) You could also supplement your all-grain wort with malt extract. You could also reformulate the recipe for a lower starting gravity. A Maibock recipe that contains mostly Pilsner malt should be boiled hard for 90 minutes. This will give you a good hot break and also result in less dimethyl sulfide (DMS) in your beer. Excess DMS in beer leads to a cooked corn aroma and flavor. Some German lagers have a hint of DMS, and just a hint isn’t necessarily a bad thing. However, an excessively “corny” beer is never appropriate. Lightly-kilned malts, including Pilsner malts — which are often less than 2 °L — contain more of the pre-cursor to DMS, S-methyl methionine (SMM) than base malts that are darker. For example, British pale ale malts are frequently around 3 °L and their SMM levels are much lower. Boiling wort vigorously for 90 minutes helps to volatilize the SMM so it won’t form DMS later. If your base malt is mostly Vienna, you could get away with a 60-minute boil, but you’ll likely have enough pre-boil wort to require 90 minutes anyway. And, if the amount of pre-boil wort you’ve collected requires a longer boil to reduce to your target volume and OG, that’s fine too. Maibocks are usually hoppier than other bockbiers. (The BJCP gives 23–35 IBUs as the range for Maibocks, as opposed to 20–27 IBUs for traditional bocks and 16–26 IBUs for doppelbocks.) They are traditionally hopped with German noble hops. Often, there is a single hop addition near the beginning of the boil, and the hops are boiled for 60–90 minutes. You can add late additions of hops to your Maibock, but keep the amount low — below what would be appropriate for a pale ale. Likewise, Maibocks are not usually dry hopped. When formulating a 5.0-gallon (19-L) batch, a good rule of thumb would be to use less than 0.50 oz. (14 g) of either aroma hops (added at or near knockout) or flavor hops (added in the last 15 minutes of boil), and the total of the two should not exceed 0.75 oz. (21 g). Once you’ve decided on your late hop additions, add bittering hops to your recipe until you reach the level of IBUs you desire. Of course, if you want to break the rules and shoot for a hoppier beer — a MaiPA? — you can go ahead and do so. Traditionally, Maibocks were hopped with noble hops. You can substitute any neutral, high alpha hop to get most of the IBUs you require, but you should also include some Hallertau, Saaz, or Tettang in the hop charges to impart some noble hop aroma. So, for example, if you were shooting for a Maibock with 30 IBUs, you could formulate the recipe such that it had two late additions of noble hops. For this example, let’s say there were additions of Tettnang at 15 minutes left in the boil and at knockout. These totaled 0.66 oz. (19 g) and yielded 2.5 IBUs. The remaining 27.5 IBUs could come from a bittering addition (at least roughly) evenly split between Magnum hops (a neutral, high-alpha hop) and some other noble hops (Hallertau, for example). The bittering addition often comes with 60 minutes remaining in the boil, although it can be added earlier. You could also use noble hops for the entire bittering addition. However, the lower alpha acid rating of noble hops means you would have to add more of them to the boil to hit the same IBU target. Given that the bitterness is at most 35 IBUs, keeping the overall amount of plant material low is not as important as it is in an IPA or hoppy barleywine. After the boil, you’ll want to quickly cool the wort. As long as it remains above 140 °F (60 °C), SMM will get converted to DMS. The next installment of this series will discuss fermentation. I do 60min boils with pils and cool rapidly. No issues with DMS.